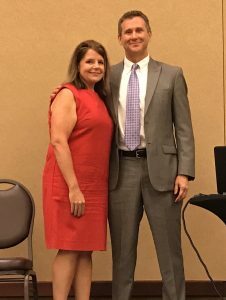 Shawna Jordan, assistant dean for student support, was awarded the Hulsing Excellence in Student Mentoring Award for the 2017-2018 school year during the Fall Forum for the College of Human Ecology in August. Dennis Hulsing, president and CEO of Hulsing Enterprises, endowed the Hulsing Excellence in Student Mentoring Award as he wanted to honor faculty that provide outstanding student mentorship due to his own experience with a college professor who helped him succeed in college. Hulsing graduated from K-State with a degree in business administration. He received the Friend of the College award from Human Ecology in 2014. Hulsing is a member of the college advisory board, the hospitality management advisory board, established the Hulsing Hotels Scholarship, and developed an internship program to help develop the next generation of K-State graduates. The Hulsing Excellence in Student Mentoring Award recognizes a faculty member in the College of Human Ecology for exceptional mentoring of undergraduate and graduate students. The intent of this prize is to acknowledge a faculty member for his or her outstanding mentoring of students in any or all of the areas of leadership, research/scholarship/creative activities/discovery (RSCAD) and service. Extra weight is given to excellence in the mentoring of undergraduate students. Trenton Kennedy, previous Student Body Vice President and undergraduate student at Kansas State University, has had numerous interactions with Dr. Jordan and has nothing but positive memories and advice from her. “Dr. Jordan instilled in me a great desire to give back to the university and to make an impact, not because she told me how to, but because I was inspired that she had done it already. I am so grateful to be one of those students who would point to Dr. Jordan as being one of the greatest and most influential people in their lives,” said Kennedy. This article was posted on Thursday, September 7, 2017, and is filed under College News, Food, Nutrition, Dietetics and Health.